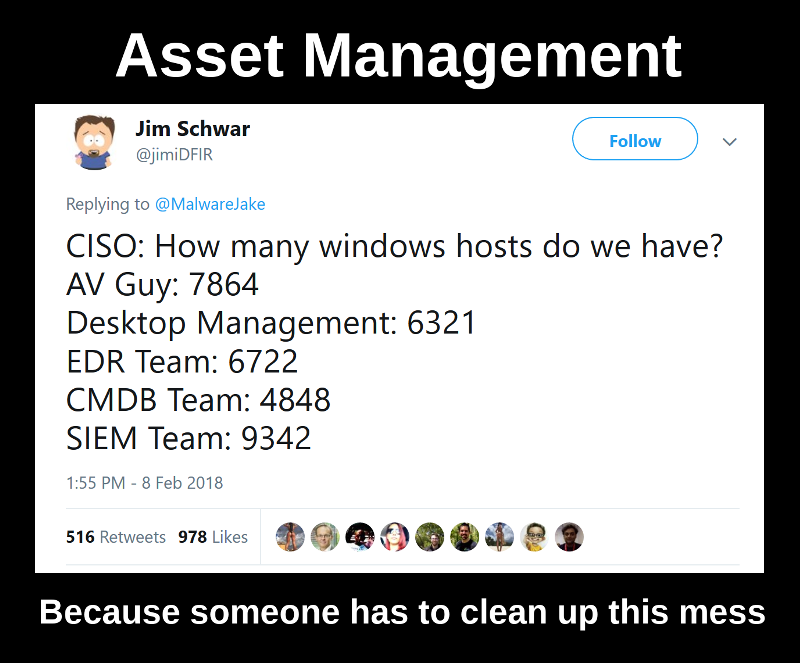 When people ask me how should they start building Vulnerability Management process in their organization (well, sometimes it happens), I advice them to create an effective Asset Management process first. Because it's the foundation of the whole Infrastructure Security. The term "Asset Management" has different meanings and if you start to google it, you will get some results related mainly to finance sphere. I use this term as Qualys and Tenable. For me Asset Management is the process of dealing with network hosts. Simply put, you need to see what is already done and what needs to be done. Without this, there will be many blind spots in the IT infrastructure, which can be an easy target for attackers. Moreover, it will be a pretty hard to show your managers that you are actually doing your job well, if you can't provide any measurable results. Go nuts by seeing all kinds of differences. Practically speaking, in a similar situation I send all the data to Splunk using custom HTTP Event collectors for further analysis and demonstrate statistics about the hosts on dashboards. If there are any anomalies (host should exist in some data source, but in fact it doesn't), I send the alerts to the owner of the datasource for investigation. I also use this system to manage Vulnerability Assessment process. Some might say that port scanning is enough for host discovery and we don't need to analyse various datasources, including those that are maintained by IT teams. But, IMHO, the active unauthenticated scanning is the dumbest way for Asset Discovery. It creates unnecessary load on network devices and target hosts and can break the servers (see my previous post "Can a Vulnerability Scan break servers and services?"). It's unreliable, because you never know if the host is inactive or you have problems with network access, or the host answers you very-very slowly and has some rare service on some rare port. I also criticized it in my post "Asset Inventory for Internal Network: problems with Active Scanning and advantages of Splunk" and it's not just me, read this page about Netbox "Why Doesn't NetBox Scan for IPs?". Active unauthenticated scanning is a good way to detect shadow IT infrastructure, that couldn't be spotted other ways. It's good to have such scans as one of the sources for Asset Management. But I don't think that it should the main and only Asset Discovery method as most of the Vulnerability Management vendors do. Especially if you have ipv6 networks, where you technically can't make the detection scans. As I already wrote in the post with the requirements to Asset Inventory systems, the best scenario if a robust Asset Management is provided by IT department. Or at least if they have a will to make the system that knows about all the hosts in the organization. It's much better to be just a consumer of this data and some times report system anomalies than to build Asset Management system on your own. Some might say that Asset Management is too complicated to do it organization wide. And it can be true. That's why you may need start with the most Critical Assets. But how to get the list of such assets and constantly update them? It's a topic for another post.